Our world-class advisors have been successfully negotiating MHC and RV Park sales on behalf of our clients for over 20 years. From the initial meeting through the sale of the property, Nye Commercial works tirelessly to understand client’s goals and to help position our clients for success after closing. 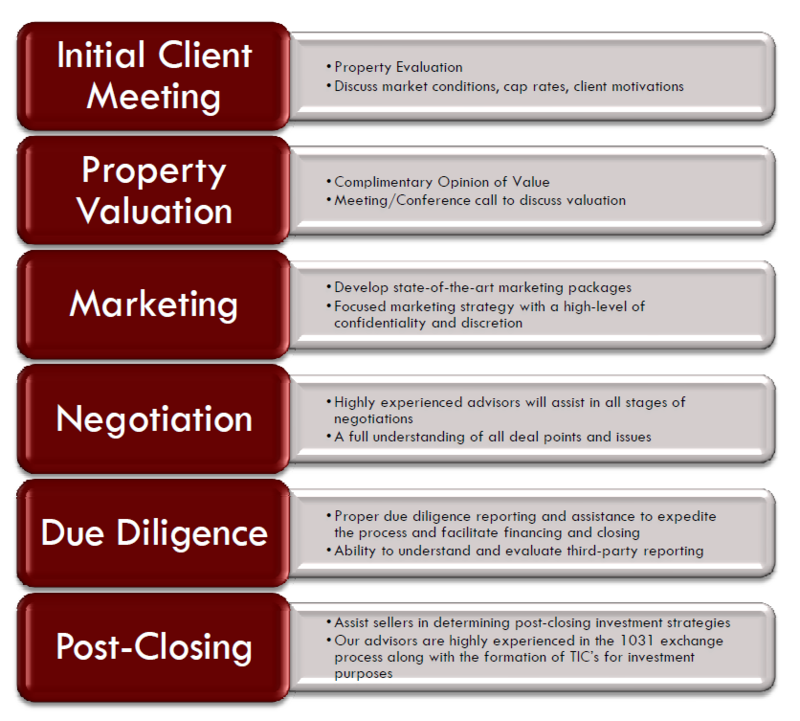 We use the process depicted on the side to maximize our client’s return. Nye Commercial works diligently to understand interest rate trends, capitalization rate fluctuations, market rental rates, and demographic trends to improve the valuation and marketing process. In any market, property owners need an experienced partner that understands the nuances of the manufactured housing industry and has the ability to maximize the sale price by effectively evaluating the asset and marketing to the right buyer. The keys to effectively evaluating the asset lie in a deep-rooted understanding of historical trends, demographic data, asset quality, and available financing. After the initial client meeting, our advisors will prepare a complimentary opinion of value to help determine if the time is right to sell an asset. The Manufactured Housing Group at Nye Commercial knows how to effectively and efficiently market MHC and RV properties. After a thorough inspection of the property and meeting with the client, Nye Commercial develops a highly effective marketing package that includes all relevant property and financial information along with projections. Further, our advisors have developed a database with hundreds of qualified investors/buyers ranging from the local “mom and pop” investor to publicly-traded institutional investor. Our relationships with these investors give potential deals and listings credibility. The focused marketing strategy is designed to achieve the highest possible price for our clients. Nye Commercial’s professional marketing and strong industry relationships are essential to maximizing deal value. The Manufactured Housing Group at Nye Commercial fully understands the necessity of confidentiality. Our advisors will market your property in a discreet and professional manner without alerting residents or on-site managers. In Florida, our advisors understand the complexities of Chapter 723 of the Florida Statutes and the concern property owners have for the relationship with their residents. All potential buyers are required to sign confidentiality agreements prior to receiving all marketing materials. When faced with a large liquidity event, such as the sale of a Manufactured Home Community or RV Park, owners often face challenges when reinvesting funds. Depending on your reason for selling, our advisors can offer different strategies for investment. Nye Commercial can assist with tax-deferred 1031 exchanges into another MHC or RV park or into another type of real estate asset. Furthermore, we work closely with investment consulting firms which can assist in other types of investment products. Our advisors understand that every situation is unique and we offer guidance tailored to each client.